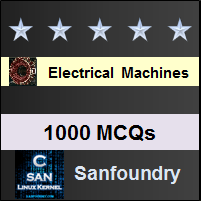 This set of Electrical Machines Multiple Choice Questions & Answers (MCQs) focuses on “Physical Concepts of Synchronous Machine Operation”. Explanation: Floating means the armature flux is zero and it neither motoring nor generating. Explanation: Field mmf leads the resultant mmf so it is generator. where Tem is developed electromagnetic torque developed in the machine and Tpm is the prime mover torque. Explanation: At steady state the net torque is zero in the machine. Explanation: Active power is proportional to the torque of the synchronous machine. Explanation: Reactive power depends on the excitation of the synchronous machine. Explanation: The resultant flux will be leading in nature, so after loading it from loading it from floating, alternator will operate at leading p.f. Explanation: The resultant flux will be lagging in nature, so after loading it from loading it from floating, alternator will operate at lagging p.f. Explanation: All the alternatives are same, varying the field flux matters at the end to change the reactive power in a synchronous machine. 9. If the 3-phase alternator has 4 poles and has synchronous speed of 120 rad/s. Explanation: Mechanical speed = electrical speed*2/Number of Poles. Explanation: As per the parabolic graph, the maxima is obtained at 90°. Explanation: It is preferred due to better power factor and low starting torque. 12. A poly phase synchronous motor will be used for the load of ______ over poly phase induction motor. Explanation: A synchronous motor is used at low speed. Explanation: Using dampers to start the synchronous motor, it will produce induction motor torque initially along with the torque due to shorted field winding. Explanation: To start the synchronous motor, it is first run as field excitation as zero, so we short circuit them. Explanation: This method is based on the operation of the induction motor, hence it will not operate at synchronous speed.